Hello everyone, how are you? I'm finally in NYC and in one piece. Thank God! I have to say the minute I landed the weather turned into humid & rainy MESS. Actually, I knew it would, I had peeked at the forecast a few days ago. Awful huh? This means BAD HAIR day.....oh well, at least the hotel made up for it. I'm staying at the Royalton & they were nice enough to give me a room with a large balcony that faces the street on the 14th floor! It's sooo cute! I promise I'll post pictures sometime tomorrow or Wednesday! 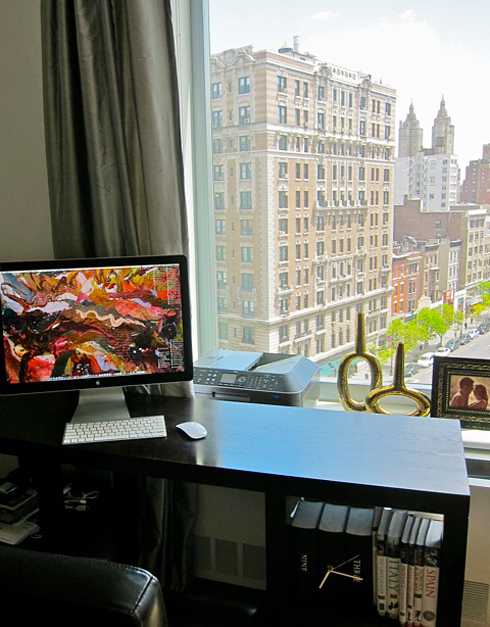 In the meanwhile, check out another cute place, this NYC pad belongs to Melanie from Luxury Monograms. You must have seen her monogrammed home decor, it's been featured on several blogs already - my favorite is the leopard print place mats! 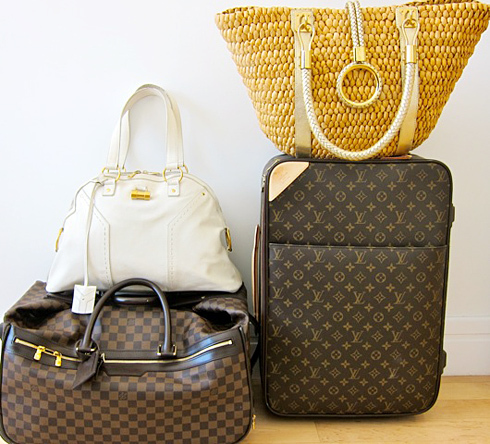 She also blogs on the Iconic Blog, which is a really neat blog mostly about fashion & Interior Design. What I love most about my home is the location. 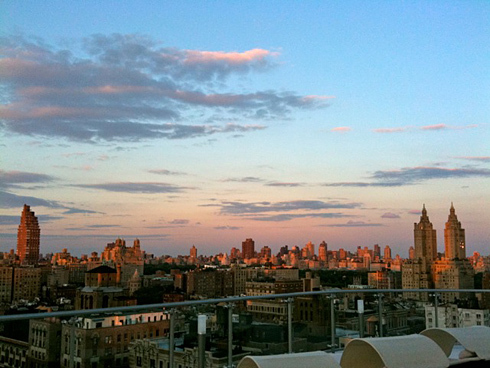 I have wanted to live in NYC for years, so to finally have a place here is such a dream. I had so much fun decorating the place and trying to utilize every last square inch. I love to entertain, so an open kitchen is a must. We have since thrown many parties here and love the flow of the living/dining space. I mean, wow. I can't imagine living with that view! What a beautiful home! Thanks for sharing! Wow love this her home, reminds my of my little condo lol. Very cute. Oh my. I would certainly love to wake up to that view everyday - quite the day starter! Have a wonderful trip. This place is so great! So single and so chic! Love it! I am in Awe, this is such a dreamy apartment. Love all the decor and that vieuw! 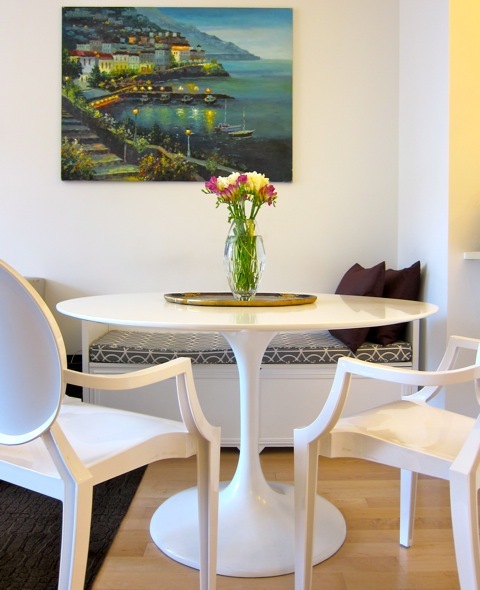 My favorite part of her home is her dining area with the Saarinen table and ghost chairs. Not forgetting the art above the bench. 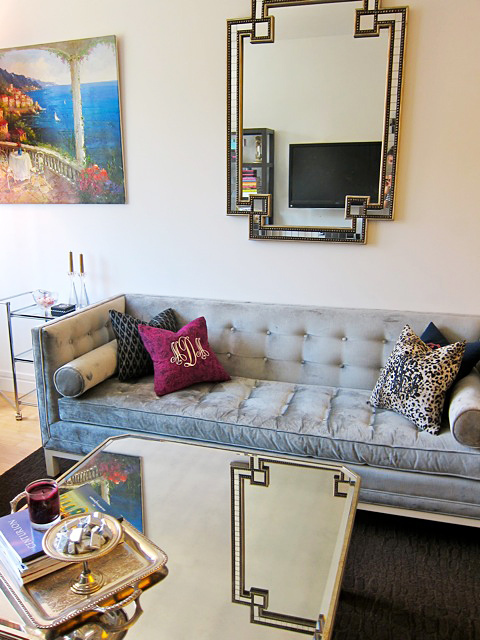 Her gray velvet sofa is lovely, too! Adorable space! 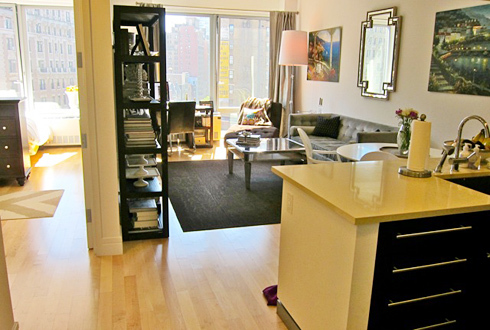 I love little NYC apartments! It's very NY -- What else is there to say!? ;) Have a great time, Jen ... Whatever the weather! This is beautiful! especially like the bedroom with the big windows.. Ooh what I would do to live there! Oh I forgot to say, Have a wonderfull time in NYC! Share us your blogfest activities. I used some of your images of your wedding for my own wedding inspiration, your wedding=lovely! 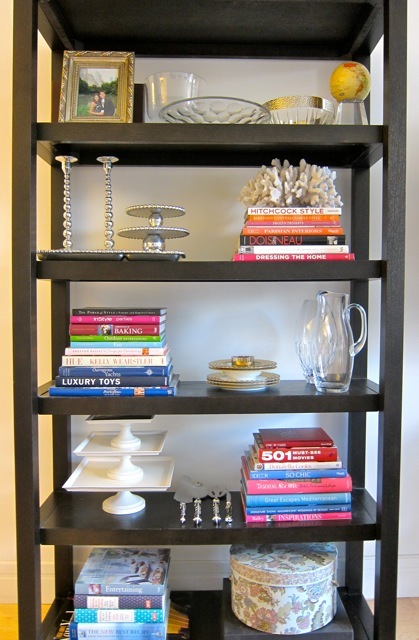 Jen thank you so much for featuring Melanie's fabulous NYC home! I cannot begin to say what I love best! I love how she placed the dresser in the room! 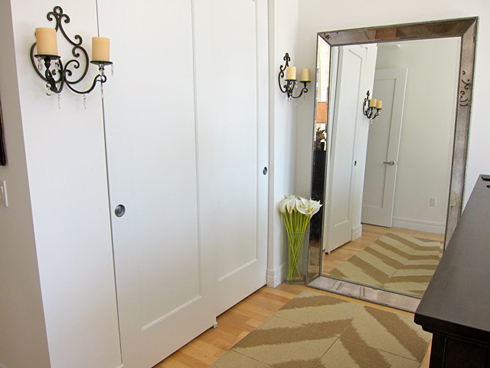 By doing that, and adding the full length mirror, she created a "dressing area" in a regular sized master bedroom! Amazing idea! looks lovely epecially the little dining corner! This is an amazing space. WOW! Well done-the kitchen banquette is a very clever use of space. Gorgeous! 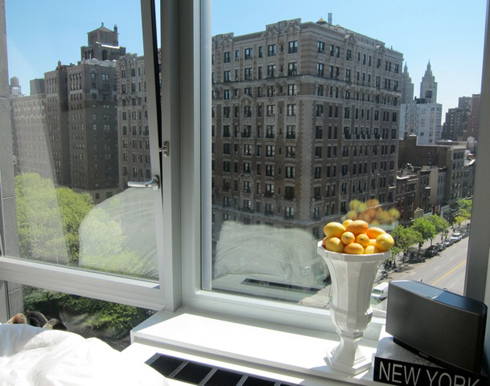 Based on the views (which are such a luxury in NYC), I guess that this apartment is on the Upper West Side. Miss you, NYC! So much. So beautiful! I wouldn't be able to work with that view. I want to know more about the bench by her dining table! Amazing that she is able to pack so much fabulousness into such a tiny apartment. That is talent! Wonderful pics, thanks for sharing!! As you can see by my blog post today, I really need to enter your closet redo feature....just have to work on the after. ha. Lucky her to live in NYC...and with such place she can afford, I love the white walls and the huge mirror..we are soon a buying a new house and I can't wait to decorate it as well...the couch is also very classy, I saw one like that in Lafayette for only $75, we thought it costs $450. and wish it would still be there.. Her home is gorgeous!! And how awesome to live right in NYC! What a dream! Her home is beautiful and the view could not be any better !! Love the living area. Okay...look at that view!!!! Wow! Also love her bedroom setup. Am in love. Love her sofa, and her views! Makes me want to live in NY...i love this. Beautiful! Love the sofa. And enjoy your time in NYC. Love how she placed the chest drawer as a headboard, clever and interesting! wowzers! Check out that view! Her bedroom is my fav! The Royalton huh? U soooo fancy lol lol. I absolutely adore the decor of all Morgans Group Hotels, so plz hurry hurry & post pics of your room. Of course you'd like the leopard print place mats Jen!!! I literally busted out laughing when you tweeted earlier, "At blogfest having lunch...I have leopard print heels for those looking". So hard not to admire a gal who loves leopard! I want to move there TODAY!!! isn't the Royalton a fab hotel, I just stayed there, it was so much fun. Have a great trip. 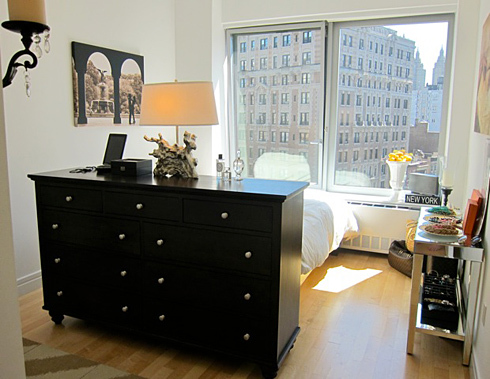 What a wonderful NY space! Reminds me of our old apt, but we did not have such an amazing view! 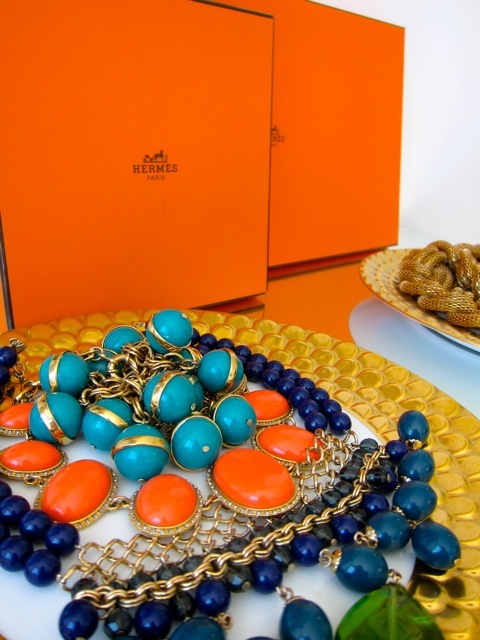 Lovely pieces. What a lovely home & view!! She has fab taste! Gorgeous home and spectacular views! Very well put together and love her monogrammed details. Btw - I just received my LOVE print in the mail and I cannot wait to frame it! Wow great views and so stylish too! Love melanie! Love the tour! What a great place. How cool would it be to wake up there everyday and look out that amazing window! She did great with the space she has. WOW, I absolutely want to live there. 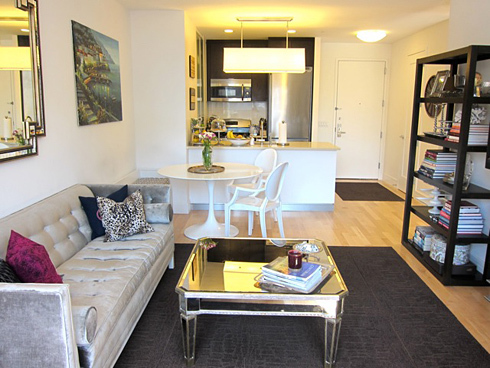 I love how open and airy the small space is, and so glam! OH my goodness, that's the life!! A CASA DA VA: I know , me too!! I LOVE your blog! I know nothing about interior design, so I always come here for ideas and inspiration. Thank you! Back To Blogging Tomorrow...I Hope!